Find out how much money you really need to live your ideal lifestyle. It’s not as much as you might think! Submit your email at the bottom of this page, and we’ll send you our Lifestyle Calculator for free. We all have dreams. Maybe you want to travel the world, become financially independent, work on a passion project, or even just spend more time with your family. Personally, I just want peace of mind and to get paid for being myself! If you want to live your dreams and work on your terms, you need to align your financial habits with your goals. Here’s the first step: use the Lifestyle Calculator to compare your current finances with those of your ideal lifestyle. How much you really need to make each month to support your ideal lifestyle. How quickly you can get out of debt if you change your spending habits and income opportunities. Your approximate income goals as you design your own unique business model. How to identify and cut unproductive spending that is out of alignment with your goals. 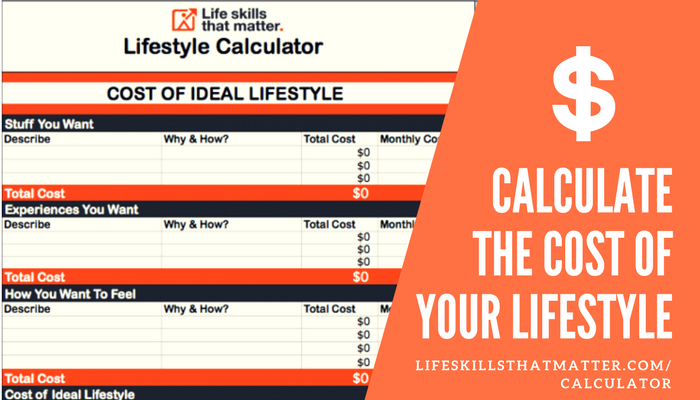 To use the Lifestyle Calculator all you need to do is plug in your numbers. All the formulas are already built into each worksheet. If you need additional rows on any of the worksheets, just insert them! If you have any questions, please contact me. The first 2 worksheets are dedicated to all of your expenses. Fill out all of your monthly expenses on the first worksheet and all of your “unplanned” or irregular expenditures over the past year on the second worksheet. On the third worksheet, list the total amount of each type of debt you currently hold in the top section. On the bottom half of the sheet, list your current monthly payment for each debt. At the very bottom you can plug in the number of months when you want to be debt free to see how that changes your total monthly debt payment. On the fourth and final sheet, do your best to describe what you want from your ideal lifestyle and estimate each expense. List stuff you want (physical possessions), experiences you want (trips, learning something new, entertainment, etc.) and how you want to feel (your physical, mental and emotional wellbeing). This exercise might be a reality check for some, but it’s not intended to freak you out! Your dreams can’t become reality until they are grounded in reality. The real goal here is to bring more awareness to how you make and spend money, so you can bring your financial activities and habits into alignment with your ideal lifestyle. Submit your email below to take your first step toward becoming self-employed and living your ideal lifestyle!